Disclosure: AisleSeatPlease was provided with products for review by ZeroGrid. Opinions expressed are those of the author, and have not been reviewed, approved or otherwise endorsed by any companies mentioned. AisleSeatPlease earns revenue for any purchases made through the links on this page. No matter how fancy your suitcase is, a little outside help in the organization department can ease the pain of hotel hopping during your trip. Don't leave it all up to a couple elastic straps inside your suitcase. Or, if you're a more casual packer, the shove-it-all-in-and-see-if-it-fits strategy. Sure, that's great when you're running late and might miss your flight (it happens), but for a smooth trip, take advantage of a little organization. If you're anything like me, on those longer trips, you might spend just 1 or 2 nights in a hotel, before moving to the next city with a new hotel. All that unpacking and packing can really eat into your time. Using a combination of packing cubes, a toiletry bag and perhaps a shoe bag or other miscellaneous bags can really help speed up the process. Just going off on a short, carry-on only adventure? Or perhaps a quick business trip? You'd be amazed how handy packing cubes can be. As a photographer whose baggage is a mix of clothing and lots of curious bits of metal that reveal themselves on an airport x-ray (i.e. battery chargers, cables, tripod head, etc...), I definitely feel the pain more often than most of going through a more thorough examination of my luggage at the airport. If you've been in this situation before, you know the drill. Oftentimes there is a certain thing that shows up on x-ray that you need to retrieve for another pass through the conveyor belt. Instead of having the TSA or your local equivalent at the airport pulling things out of your bag in what is going to then be a fun game of 'will it all still fit back into the suitcase? ', packing cubes have saved me more than once. Being able to quickly pull one or two cubes out to get to the item of interest has saved me time and hassle on a number of occasions. Maybe this is a less common situation for some, but if you've ever gone on what I like to call a multi-climate trip, then it's packing cubes to the rescue again. Visiting both a hot and cold place? Separate out your clothes for hot and cold weather and take advantage of having cubes to just reshuffle in your luggage to put whichever ones you need on top of your other luggage. There's a number of brands out there now with their own line of packing cubes. I recently spent 8 days in India using ZeroGrid's Packing Cubes Travel Organizer Set w/Shoe Bag. The set includes one large packing cube, two small packing cubes (comparable to what other brands might call a "half cube"), and a shoe bag. The large cube is great for packing shirts. If I have the time, I sometimes even try to order the shirts in the cube based on the order I plan to wear them. There's something nice about arriving at your destination and not having to think too much each day about what to wear. The smaller cubes are well suited to pack your socks and undergarments in. I often squeeze a few USB cables or a battery charger or two as well in these cubes. In theory you're better off rolling your clothes for less wrinkles before packing, but your mileage may vary on that. Besides the clear organizational benefits, the fact that these cubes have zippers to close them means you can actually take advantage of them to compress your clothes too. While it's thankfully been a long time since I last had to sit on my suit case to zip it closed, having your clothes compressed a bit before packing makes life a bit easier. Given the ripstop nylon construction, the cubes are pretty durable, and as is common amongst other brands, there's a mesh see-through top so you can easily identify what's inside too. Compared to another brand's packing cubes that I own, in addition to having a handle on the side of the bag, ZeroGrid's also has one on the top of the cube. It's a nice touch to make your cubes easier to pull out of your bag regardless of orientation. Especially when you're stuck re-arranging your luggage after a surprise airport inspection. TIP: Around midway through your trip or so, you'll reach the clean/dirty tipping point. The point where you have more dirty clothes than clean ones. Re-packing your dirties into a packing cube is a great way to stay organized as you near the end of your trip. Ok, this one should be fairly obvious, but if you're going to be packing some shoes into your luggage, you really don't want them to dirty up any of your clothes. Some dress shoes may come with their own shoe bags when you buy them, but usually they are made with soft cotton. They're great for storage, but if you're traveling, they may not hold up as well. Especially if you go through any wet or snowy climates. On the plus side, the shoe bag from ZeroGrid is not only waterproof, but it's included with the packing cube set. It can be a bit hard to comparison shop amongst brands, but overall it feels like you're getting a little more for your money. On the down side, if you're traveling with a pair of boots, then you'll want to look for something more appropriately sized. When I traveled to Greenland in the winter, my polar boots were quite large and I ended up having to buy a pair of waterproof bags to store them in. As long as you're traveling with a typical pair of sneakers or dress shoes though, this bag will be a great fit. As a friendly reminder, the TSA's rules for carry on liquids, also known as the 3-1-1 rule, allows you to bring as many containers of liquid in containers no larger than 3.4oz (100ml) as you can fit into a single 1 quart-size bag. Each passenger is allowed 1 of these bags. When it comes to carry on baggage, you can find some cheap re-useable 3-1-1 bags out there, or just go with a simple 1qt. ziplock bag. The benefit of the re-useable bag is obviously our environment. If you can fly carry on only, then that's the best. For those longer trips where you do need to pack some more toiletries than a 3-1-1 bag can accomodate, you really want to use a toiletry bag. Simple reasoning is that you don't want your sunscreen or other liquids to leak out during flight and ruin all your clothes. This has actually happening to me at least once or twice, but luckily I had the liquid in a toiletry bag, and so while annoying at the time, at least the damage was limited to just my toiletries. Travel disaster averted. The other reasons you'll want a toiletry bag are for simple organizational and convenience reasons. It's a lot easier to grab your toiletry bag and put it in the hotel bathroom than fish out your toiletries one at a time from your luggage. Again, you also help out our planet when you use re-usable bags, so you can feel good about yourself for that too. 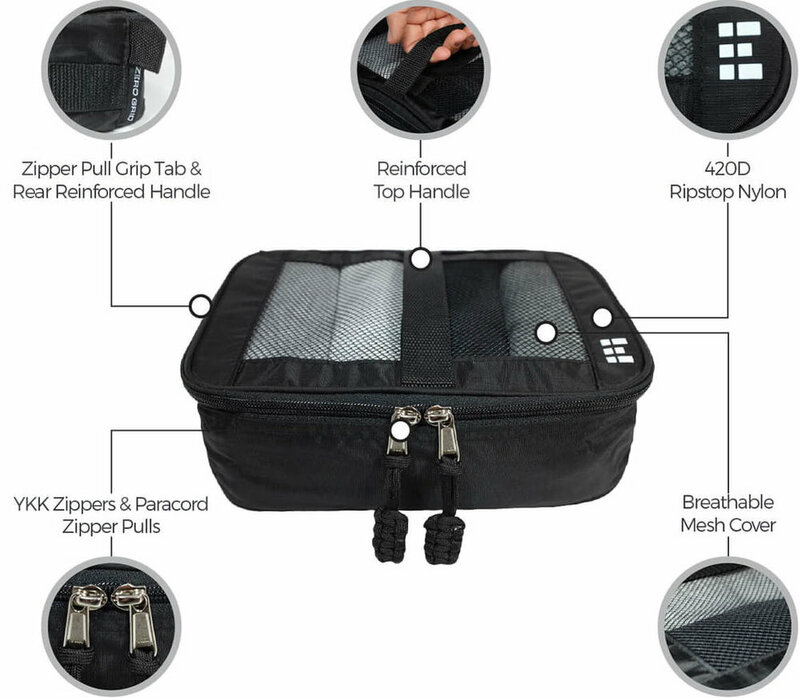 The ZeroGrid Toiletry Bag is really spacious as far as toiletry bags go. Going somewhere sunny and need a lot of sunscreen? You'll be able to fit in that full-size bottle of sunscreen in your bag. With some other bags I've run into the problem where 95% of my toiletries will fit into the bag, but then I'm stuck with the one or two things that don't fit. And then what? Worry that it might burst mid-flight? ZeroGrid made the bag quite durable using tough, dual-layered 420D ripstop nylon. In addition to being tear-resistant, it's also liquid resistant. It's a really practical feature for a toiletry bag. I know it sounds so basic, but if you get a freebie toiletry bag from buying a cologne or perfume set, you might later regret not getting a proper toiletry bag, especially when it's a pretty cheap travel accessory. From an organizational standpoint, there is one interior zippered pocket for some smaller items. Like the packing cubes, there's an easy to grab handle so you can pull the bag out of your suitcase when needed. Overall, I think this is a great bag for those that like (or "need") to bring a lot of toiletries with when they travel. Especially when there's a lot of small bottles or other magical potions going in the bag. Are you one of those people that can't get by on just a tooth brush, toothpaste, and some deodorant if needed? This bag might be for you. To summarize, always use some packing cubes when traveling. They help keep your luggage organized, they're lightweight, compress your clothes, and are pretty durable. Similarly, if you're going to be checking a bag, make sure you put your toiletries into a dedicated toiletry bag to prevent any nasty spills in your luggage from ruining your clothes. If you think these products sound like welcome additions to your travel gear, you can buy them on Amazon through the links below.